WHAT TO EXPECT The Small Isles – Muck, Eigg, Rum and Canna – are a group of islands west of Arisaig. 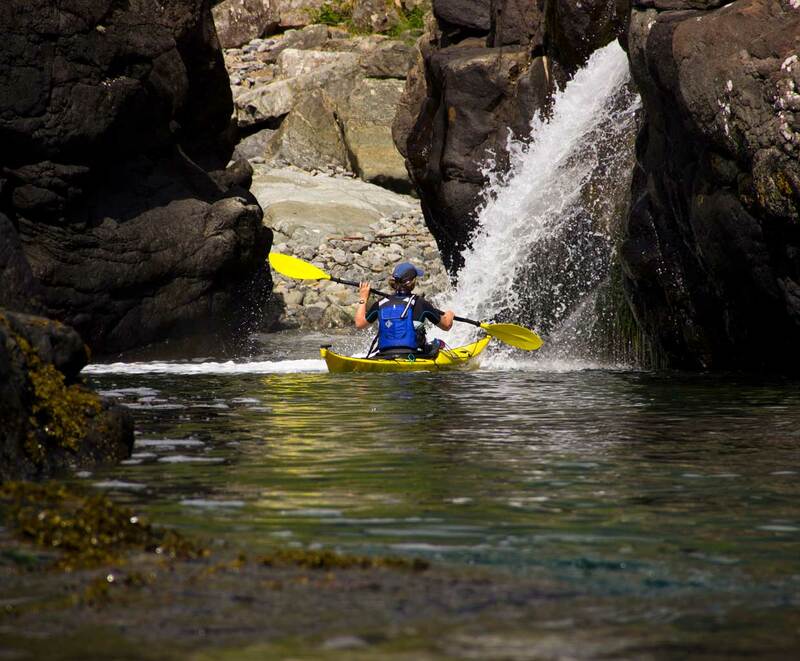 Rich in marine life and with a dramatic coastline of cliffs, sea caves and secluded bays, the Small Isles are a fantastic sea kayaking destination. Exploring them will be our objective on this trip - paddling the open crossings between islands and exploring the wonderful variety of coastline. This is a true sea kayaking expedition: We will be entirely self sufficient, carrying all the food and equipment we need and paddling in a range of conditions. 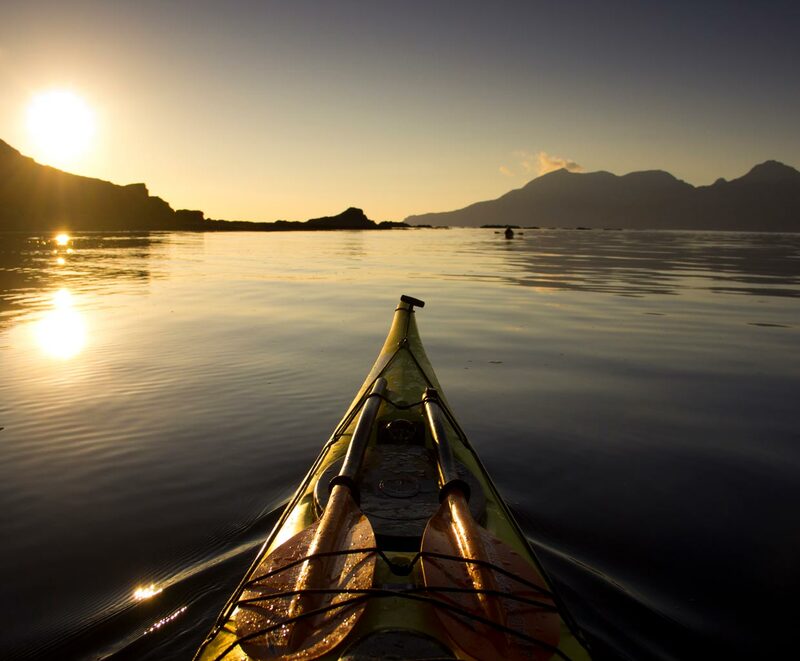 TRIP HIGHLIGHTS A six day kayak expedition exploring the islands of Eigg, Muck, Rum and Canna, with open crossings between the islands and exposed coastline to explore. Wild island full of individual character and history. 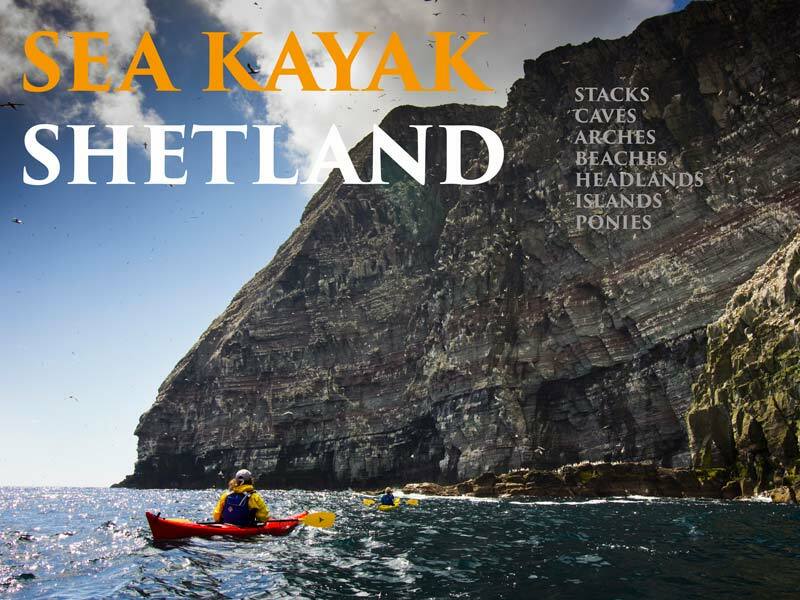 Wild camp in spectacular places or stay in bunkhouses/huts in the small settlements on the islands. The islands are rich in wildlife - Eagles and Puffins, Seals and Otters, Dolphins and Whales can all be seen here. 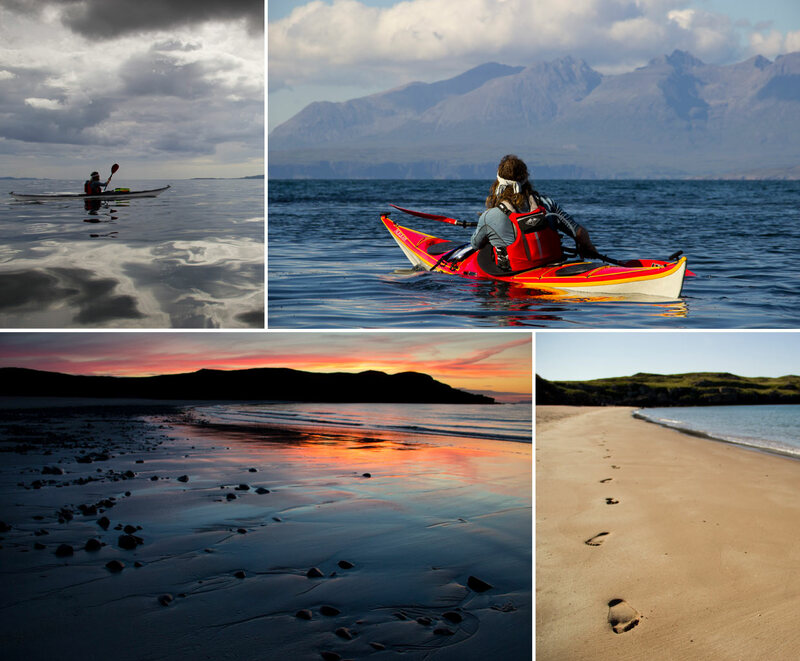 A chance to build more advanced sea kayaking expedition experience and improve your skills. *LEAVING CROSSING ARRIVING - Nowadays its almost impossible to know distance, we can compare and equate kilometres and miles and work out timings and routes but it all goes by so fast - the blur of objects passing windows faster than we can realise. Sitting in a kayak at the edge of the Arisaig Skerries, the bow pointing towards the Isle of Eigg and we can start to think about how far those 12km actually are - a distance that will occupy the next two hours of our effort and time. The small skerries have passed in the detail of crabs scurrying along the sandy seabed or the weave and glide of the kayak between the rocks. Ahead of us is a deep blue - an open space bigger than anything we have ever known.  Mid-way through the crossing we can pause and just float, fully aware of being out at sea - the circling Shearwaters and the dark hump of a Minke Whale showing us welcome flashes of detail framed in the outline of islands. Those first few steps on dry land, the turn back and the slow squint at the hazy shape of land we have paddled from. Through leaving, crossing and arriving on the island we get to know, really know, how far we have come. Those 12km are mapped not in an abstract number but in our effort and strength, thoughts and feelings, sights and sounds - The first 12km of a slow, purposeful and beautiful journey. *A WILD BEACH AT SUNSET - The beach lay at the north end of Rum, the Isle of Skye a distant, jagged skyline above the sand and sea. At the top of the beach was small area of dunes and grass where we pitched our tents, now lit up by the low sun. The evening was still and clear, we had sat together for dinner, sharing the preparation and cooking before dispersing to some part of the beach or headland that caught our curiosity and led us off into the wild. The Red Deer watched us from the hillside above and the Terns darted overhead, screeching down on us if we ventured too close to their nests. I made my way down to the beach and watched the Oyster catchers. Two pairs of birds scurried across the sand, flew low and piped loudly or watched from the rocks above. 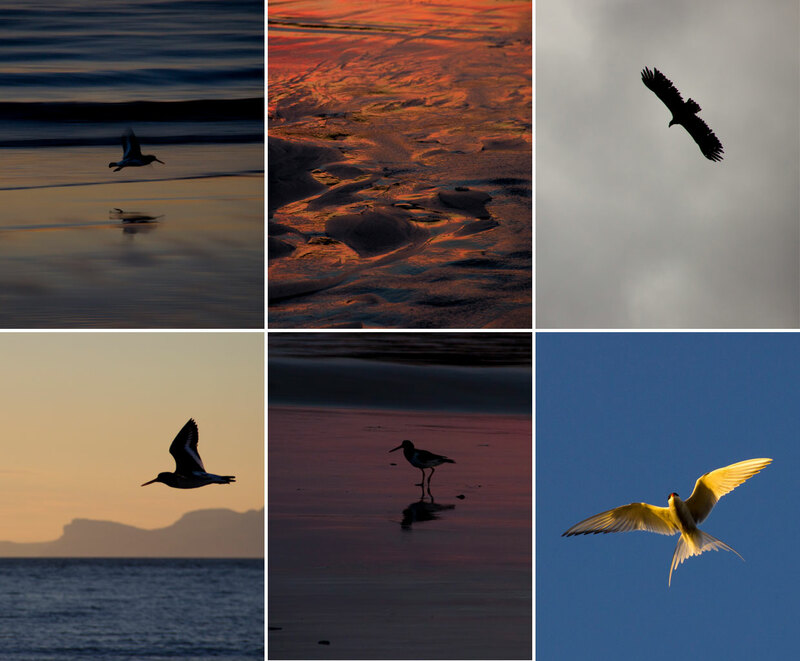 As the light faded and the stillness grew, the movement of each bird became a dark shape blurred across the deep glow of the reflected light in the sand and sea. As the sun dropped below the horizon, we re-grouped on the beach, lit a small fire and shared a wee dram, recounting the days adventures on the sea. *AN ISLAND HOME - Arriving at the sandy lagoon between Canna and Sanday and hearing the sound of voices lift over the dunes seemed a little strange after the rhythmic churn of the sea - a little strange but welcome. The crossing to the island tested our skills and nerve as we negotiated the exposed coast of the Isle of Rum, pushing us to use the tactics and experience we'd gained from our time on the sea. Paddling on past the waterside houses, we land on the small beach in front of a long white building - Cafe Canna, and set about exploring the menu. The afternoon passes on island time - friendly words with the few locals we meet, eagles overhead and footprints in the sand. That evening our cafe table is stacked with Lobster - landed that afternoon from a local boat and we catch in each others eyes a knowing flash - we have definitely earned this! FOOD Includes meals - lunch on day one through to lunch on day 4. We can accommodate any dietary requirements if notified in advance. START AND FINISH Meet at Arisaig at 09.30. Finish at 15.00 - 18.00 Arisaig. 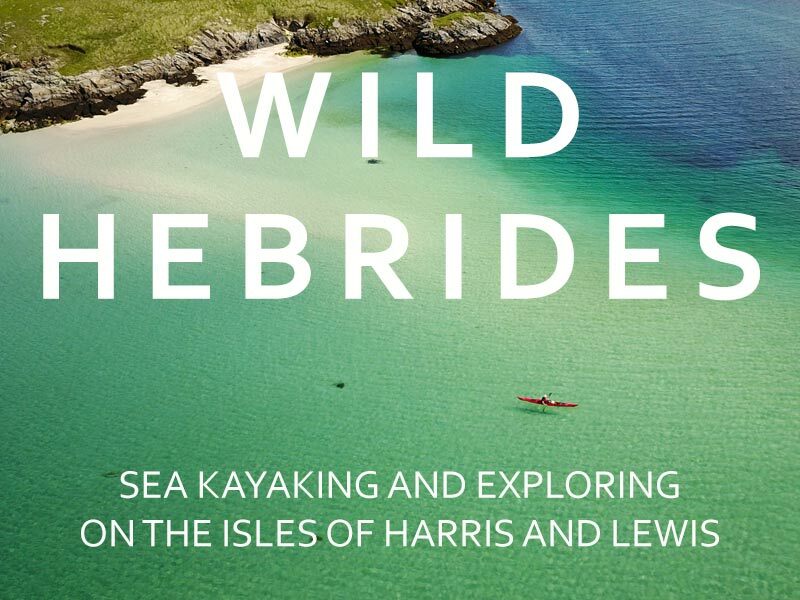 TRIP GRADE This is an expedition style trip, we will paddle variable distances each day depending on conditions but these could include some longer days - we have paddled single long days before on Small Isles trips of up to 35km. An average daily distance would be about 20km -25km. The islands are open to the wind and swell from multiple directions and so it is very likely that we will experience wind and waves at some point in the trip and we may need to paddle in winds of force 4 and 1m waves for sustained amounts of time. The trip also features several long open crossings, up to 12km.